Fiberglass exterior offers the finest wood-grain texture with less maintenance than natural wood. Impression Collection doors have been designed with an beautiful molded wood-grain fiberglass surface concealing durable steel construction. Enjoy the beauty of wood doors without the maintenance. Foamed-in-place polyurethane insulation with an R-value* of 7.6 helps control costly heat loss and gain. This type of insulation can diminish street noise and provides for quieter door operation. Designed with award-winning safety and technology features including pinch-resistant door panels. Bulb-type bottom weather seal guards against wind and rain while providing a cushion when closing. Fiberglass exterior Utilizes Therma-Tru™ AccuGrain™ technology for the beauty of wood without the maintenance. Our Impression Collection comes in 4 various designs to meet your needs. 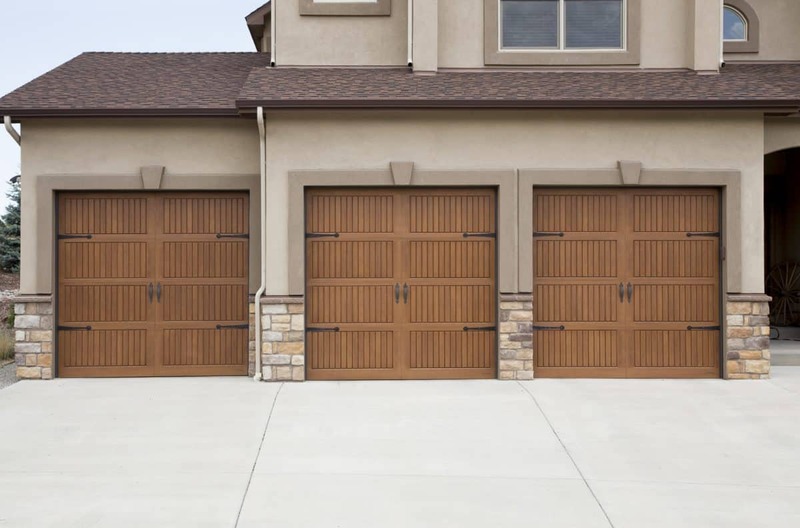 If you’re looking for a garage door style that captures the warmth, beauty and detail of natural wood without the maintenance, then the Overhead Door™ Impression Collection is perfect for you! These doors feature a wood-grain fiberglass surface while masking durable steel construction. The Impression Collection doors are available in various panel styles, 10 different stain choices, as well as multiple window, glass and decorative hardware options. This home features three 9′ by 8′ vertical slat panel (Model 983) doors with a beautiful walnut stain finish. To power these doors, three 1200 Destiny® openers were installed with an exterior wireless keypad. After installing Impression Collection garage doors, the finished garage entry is sure to reflect the best of personal style and unmatched elegance.